With the Mobile Outreach programme, CANSA creates awareness of breast and cervical cancers through the promotion of healthy living lifestyles and the prevention of disease with the emphasis on early diagnosis and referral. This screening project was implemented during 1990 to 1994 and was initially funded by the Independent Development Trust which sponsored one vehicle. The project was re-launched in January 1997 after funding was obtained from Ely Lilly. It then offered services in one region in the Free State Northern Cape for a period of six months. Then the mobile clinic moved to the next region. CANSA received a new vehicle from Avon during January 2003 which enabled us to expand our visits to more regions and also to the deep rural areas in the two provinces. This project targets women over the age of 20, although all women who are sexually active are welcome to register. Services are rendered in rural areas where prevention and early detection services for cancer were previously almost non-existent. Currently the project consists of two Mobile Units (clinics) manned by drivers and Registered Nurses who travel to a specific area. On average each nurse does 35 breast examinations and Pap smears daily. 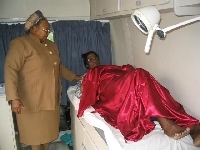 Women with any abnormalities detected are then referred to the appropriate treatment centres. The project is a joint venture between CANSA and the Department of Health (both Free State and Northern Cape).